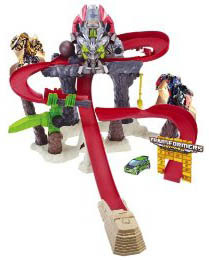 This Transformers RPMs track set puts you right in the middle of fast-paced action and comes with four cutout action scenes for an even bigger challenge adventure. Watch out for the gnashing Vortex Grinder with glowing eyes and battle sounds. Leap across the grasping claw hand or outrun the out-of-control smasher. Break through the barricade, but look out for the swinging shovel. Comes with an Autobot vehicle. Transformers RPMs are available for Optimus Prime, Bumblebee, Megatron, and Autobot Rachet.